The lighthouse was commissioned on January 1, 1890. The tower stands 38 feet high and is the shortest lighthouse in the state. It is constructed of bricks (made right on site at a cost of $2,900) with iron plates (made in Portland and shipped by wagon) covering it. The original addition that now houses the interpretive shop was built in 1895 - the current interpretive shop replaced the original work room in 1978. The keepers houses were located where the parking lot and kiosk are now situated. The houses cost $26,000 to build. The nearby city of Bay Ocean was founded in 1912, making shopping easier for the families at the lighthouse. 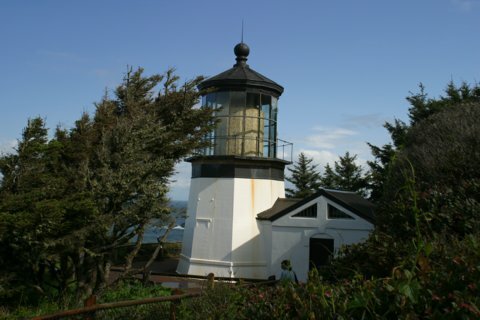 The lighthouse was decommissioned in 1963 and heavily vandalized before the 'Friends of Cape Meares Lighthouse & Wildlife Refuge' took over. Daily April through October from 11 am to 4 pm. Again, we run into a lighthouse in the midst of restoration. First it was Cape Blanco and now it's Cape Meares. The Fresnel lens had plywood covering it (at least we assume the lens was behind the plywood). We didn't get there during the times they were open so we couldn't go inside but you can still walk around the light. From US101 in Tillamook turn west onto 3rd St. In 1.7 miles, after crossing over a piece of Tillamook Bay, turn right onto Bayocean Rd. In 2 miles turn right onto Lighthouse Rd. Follow it to the end and the parking lot. From there it's a short walk down to the lighthouse.